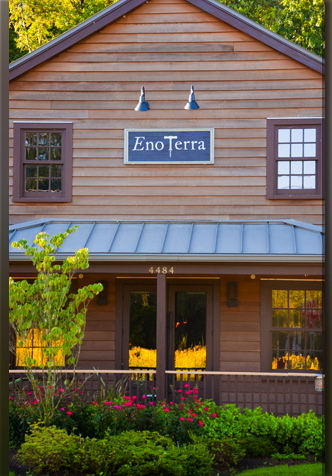 About a year ago we went to Eno Terra and as I remember, loved the food. This past weekend we wanted to go somewhere different for dinner and remembered how good our meal was. We immediately asked ourselves why haven’t we been back? Seems like many awesome meals have been missed over the past year. With a spotlight on fresh, this Princeton area restaurant is known for their eco-friendly ways. Their motto is “Eat Local, Drink Global.” Eno Terra proudly harvests produce from their own farm, located just yards from the restaurant. When needed, they source from other local farms and carefully selected suppliers. I love to eat locally. Better for the environment and it results in the freshest flavors on your plate. The restaurant has a warm, urban feel with attentive, friendly service. All the servers were well educated on both the food and the wine. Eno Terra’s extensive wine list includes both bottles from their wine cellar and wines preserved in their Enomatic system. The Enomatic wine preservation system displaces the air in the open bottles for optimum flavor preservation. Alan had an Italian Uvaggio which he loved. The waitress was happily helpful, bringing us a number of wine tastings until we found a glass we loved. Choosing our meal was easy. We ordered everything. Well not everything, but the food kept coming. Course #1 – we shared their Salumi e Formaggi platter. Delicious cheeses paired with Italian smoked meats, marinated olives, spiced cashews, local honey and yummy fig mustard seed spread. Delicious. Course #2 – Bucatini al “Amatriciana” to share. Bucatini pasta with a smoky red sauce, spicy with chilies and diced pancetta. Course #3 – one double thick grilled pork chop with creamy sweet potato mash and red cabbage slaw and a grilled rib-eye steak with roasted cipollini onions and greens. Both were off the charts! Lastly, two vegetable sides. Why? Because they just looked so good so we couldn’t resist. Cauliflower roasted with pine nuts and salumi, and brussels sprouts, both right from their farm. How could we leave without dessert? Never! Buttermilk panna cotta with apples and a pear & cherry cobbler with cinnamon ice cream. They feature local artisan ice cream and sorbet from The Bent Spoon, in Princeton. Perfect sweet treats to end a perfect evening. With our doggie bag in hand, we rolled out of there happily full, only to be disappointed the next day that our leftovers were still in the car. Oh well, that just intensifies our need to go back again soon. If you’re in the Princeton area, Eno Terra is a must try! Bucks County locals, it’s worth the 30 minute drive. All you foodies will not be disappointed, I promise.